£100 non refundable deposit secures booking with the remainder due 8 weeks before unless otherwise stated. Damage bond of £100 also required in addition to the cost and this returned within 7 days of departure providing everything is OK with the caravan and its contents. If the booking is within the 8 week period, then the full balance is due in full. Check in is 3pm and check out is 10am. 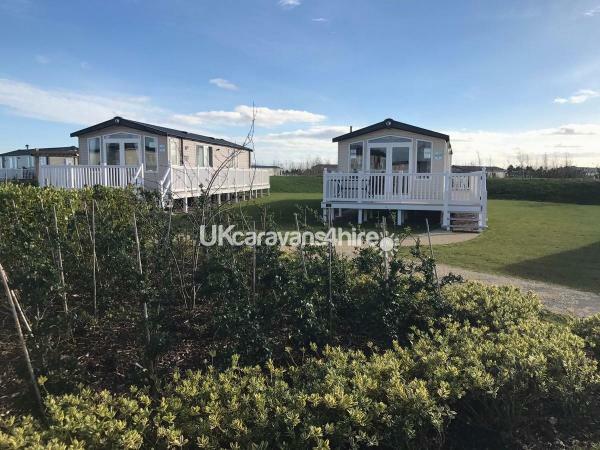 Our booking terms are: £100 non-refundable deposit at time of booking to secure your dates and £100 damage deposit which is returned 7 days after your holiday, when the caravan has been cleaned and checked, providing it does not smell of smoke. Full balance is to be paid no later than 8 weeks prior to your arrival date, or in full if your booking is less than 8 weeks time. Total price £***** + £100 damage deposit. This includes gas, electric and water. No dogs and strictly no smoking anywhere on the premises. Bed linen is not included and entertainment passes can easily be purchased from reception. If this is all acceptable I will forward bank details to pay by bank transfer. 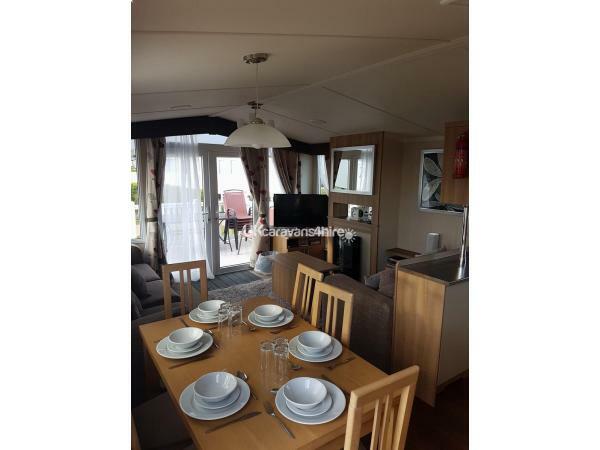 This beautifully presented 3 bedroom platinum top spec caravan with veranda to the front and wrap around decking in a real quiet location. It is well maintained and a full inventory can be found in the caravan ensuring you have the best holiday. It has its own numbered parking space (please no parking on the grass). We are child friendly and can provide at no additional cost a high chair, travel cot and bed side guard, baby bath for your use, saving you money instead of hiring from site and also saving space in the car. Lounge - There is ample contemporary free standing furniture, 40" flat screen TV, DVD player built in, coffee table with upholstered cube stools and electric fire (new for 2018) Iron and ironing board. A selection of DVDs, Board games, jigsaws are available to use. There is also a Nintendo wii for the kids. 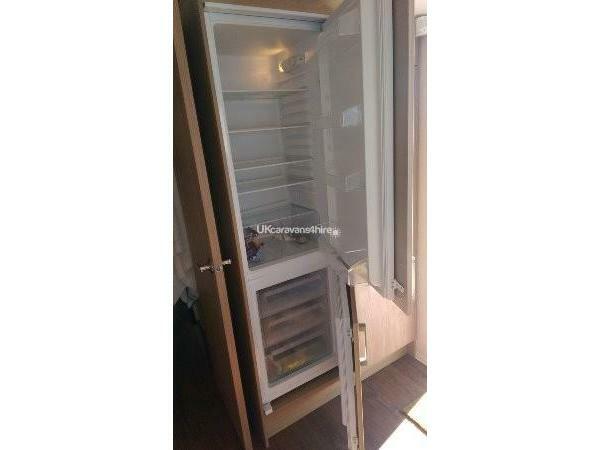 Kitchen - Furnished to a high standard with large integrated fridge freezer, microwave, 4 ring hob, cooker and extractor fan. All utensils are provided including all pots, pans, crockery and cutlery. Dining Area - Is a spacious area with freestanding table and chairs. Bedrooms - The main bedroom has a large double bed with a 32" TV with DVD player built in. There is room for a travel cot at the bottom of the bed and also has an ensuite toilet and sink. We also provide the master bedroom with an hairdryer. The 2nd & 3rd bedrooms have 2 x twin beds which can be pushed together to create a double bed. The caravan comes with duvets and pillows for the beds. The master bedroom also has a memory foam topper. Bed linen is now included for 2018, passes are not provided. However if you require use of our cotbed we advise guests to bring their own bedding for that. Please also bring with you bath towels, tea towels, washing up liquid, sponges and toilet paper etc. We try to supply washing up liquid, teas, coffees, sugar/sweeteners, toilet rolls, kitchen roll, sponges. 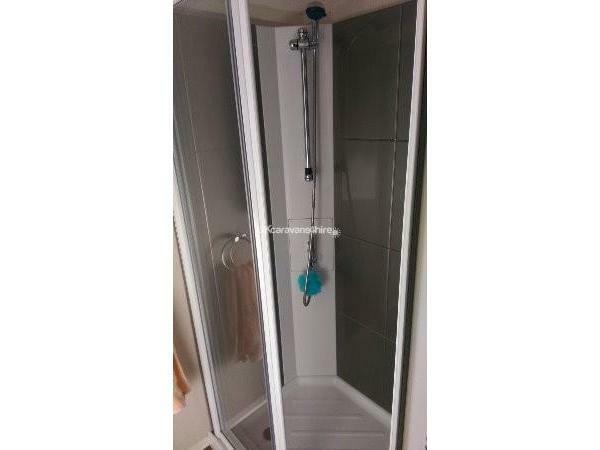 Bathroom - Fully fitted double shower with glass sliding door, toilet and wash basin with overhead mirrored cabinet. Veranda - Enclosed decking to the front of the caravan with furniture (table and chairs with an umbrella) where you can take in the beautiful panoramic views. There is also additional furniture at the side of the caravan. Situation - The caravan is situated on Kestrel Heights which is about a 5 minute walk to the complex and 10 mins to the beach. A great location and has its own private parking space. Restaurant, Grocery Shop, Laundrette, Bay view restaurant on beach front. Beach. Coastal walks. 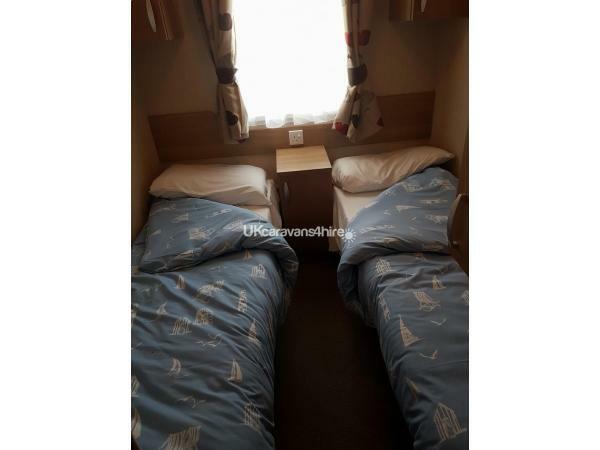 Beach, Scenic Walks, Watersports, Nature Reserve, Golf Course, Amusements, Pubs and Clubs, Theme Park, Takeaway, Fishing, Historical Attractions, Indoor Pool. A fantastic caravan in a beautiful setting. Please come and enjoy. What can I say.... From start to finish it was a fabulous holiday. The park is beautiful, amazing facilities onsite. 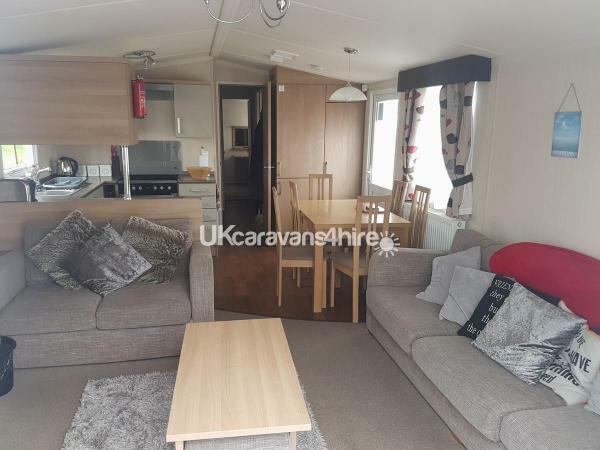 The caravan was in immaculate condition, everything you needed for a short break to a 2 week holiday ( wished we had stayed for longer) I found Gareth to be extremely helpful from the get go, really quite response & amazing information on any questions asked. Currently looking at when we are able to come back, and have recommended the caravan to god knows how many people... The caravan couldn’t of been in a nicer area, the kids enjoyed flying around on the scooters & the older kids enjoyed the nitendo wii ... all in all one of the nicest holidays we have been on. You won’t be disappointed . We can’t rate the caravan highly enough. We booked a very last minute few days away, Gareth was very quick to respond to my questions and was really helpful throughout. 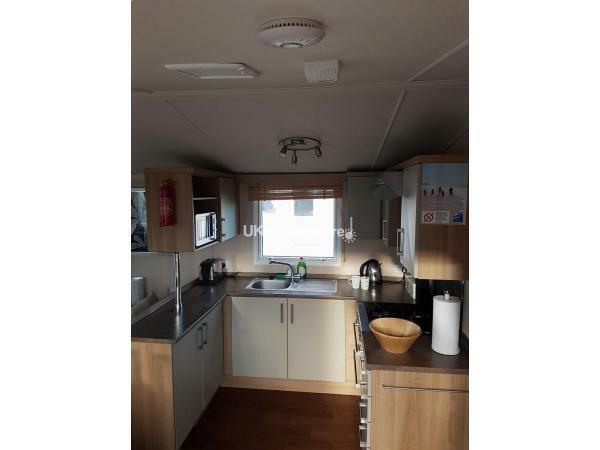 The caravan itself is immaculate, homely and has absolutely everything you need. It is away from the main hustle and bustle which we enjoyed as we were close enough to go in and out but far enough away for feel relaxed. All in all we thoroughly enjoyed it and if we are holidaying in Devon again it will be the first place we look to book. Thanks Gareth and Louise! Many thanks both. Glad you and the family all had a great time. Thanks Chris & Family glad you enjoyed your time and enjoyed the location. We hope to accommodate you again, in the not to distant future. Just finished a fantastic stay in this caravan. The caravan was so clean and spacious even with two small children in tow with all their stuff. It was well situated away from noise and no excess foot traffic. Gareth was more than helpful throughout the entire booking process even with my endless questions. I cannot recommend this highly enough. We will most definitely be booking again soon. Thanks for the great review. We'd love to welcome you back anytime. We had a lovely week st Devon cliffs. The caravan is in a great location... a short walk from the main centre so lovely and quiet. It was fully equip for our weeks stay and in a good, clean condition. Gareth was very attentive and made every effort to answer any questions and queries we had. Thank you for making our booking and stay so easy and straightforward. It’s the first time we have hired directly from an owner, having used Newmans for over 15 years, obviously there was naturally a little trepidation about doing it this way. Can I firstly put anyone’s mind at rest in doing so. Gareth’s communication was immaculate throughout the whole process and the £100 bond was returned immediately to our account upon returning home. Onto the Caravan. The unit is situated in a beautiful, peaceful area of the park, really safe for anyone with toddlers or smaller children with its end of Cul-de-sac location. The caravan was immaculate, spotlessly clean and very well provisioned. We holidayed with our older children...22 and 18 with both of their partners and found it plenty spacious enough to accommodate the six of us. To top it off, a lovely holiday in a perfect location, in a beautiful, spotless caravan with a larger balcony with furniture. Thankyou very much Gareth, we will definitely be returning soon. We had a lovely stay at the caravan we have 2 teenagers and 4 year old twins and it was like home from home. The location of the caravan was perfect plenty of space for the children to zip around on their bikes and scooters with no worry of traffic. The caravan itself was 100 % clean cosy and welcoming and on arrival Gareth had supplied the essentials...bread milk and even a bottle of wine as well as sweets and colouring books and pencils for the twins.. so very thoughtful. We will definately be rebooking. Thank you once again Gareth and family for making our stay so comfortable totally 5 star accommodation and service. Thanks for the great comment. We'd love to see you come back to DC. If I could score higher than a 10 I would!!! Amazing holiday. Gareth could not do enough for us leading up to us going, he even booked actitivites for us which our son thoroughly enjoyed. Caravan very quiet location but still only a short walk to the complex. We did not want to come home! Glad you enjoyed Kim and family. We'd love to welcome you back again. 2nd time that myself and family have stayed in this lovely maintained caravan. Always clean and plenty of things to do for the family if you wanna stop in for the night. Nothing seems to be to much trouble for the owner. And we will be booking a 3rd visit for later on in the year. Glad you and your family enjoyed your 2nd stay. We can't wait for you to return for a 3rd time. Thanks for the nice review Rachel. We hope to welcome you again, should you come back to Devon Cliffs. Really enjoyed staying at the caravan. The position is quiet and flat- kids enjoyed using their scooters. Caravan is well equiped clean and tidy. Gareth is extremely helpful and responds quickly to every enquiry. Great stay! Thank you Tess. Glad you all enjoyed your stay. Hopefully we can welcome you back in the future. Fantastic holiday, great caravan, couldn’t have asked for more. Returning from a fabulous weekend away. Spotless caravan in a lovely part of the park. Fully equipped with everything you would need. Would highly recommend booking this caravan and will be doing so again next session. Thanks again. Many thanks for staying with us. Plus the great review. We look forward to you staying again. We had a great time here. Lovely, clean & tidy caravan. It had all that you would need for your stay. Was great to have the use of the bed guard, high chair & travel cot for our young children. Nice quiet, lovely area of the holiday park. Would definitely recommend this to others. Thanks Ben & Family. Hope to welcome you again in the future. Glad you enjoyed the lovely and quiet location also. Many thanks for the feedback Steve. Glad you enjoyed your stay. Sorry that the tourist folder wasn't available for you. Hope to welcome you again. Glad you enjoyed. Hope to see you and your family again. We had a brilliant short stay in this caravan. The small touches make a big difference, children's dvds and jigsaws, kitchen things such as cling film and foil, kitchen roll etc, all those small things you forget to pack! And the welcome hamper including Welsh cakes was a lovely welcoming touch. Gareth has always been quick to reply to any questions or queries and we're looking forward to staying again. Thank you Gareth. Lovely Caravan in a great location on site. Gareth could not be more helpful. Definitely recommend the caravan & Devon Cliffs. The Mrs thought is was helpful to have an airer, hoover & an ironing board. I didnt notice :). The children also loved the dvd's & jigsaws in the caravan. Thank you Mrs Oddy. Glad you enjoyed. We look forward to welcoming you back next year. We have just returned from a fantastic holiday in this beautiful well equipped caravan very modern and has everything to make your stay even better than you can imagen, the big tv with dvd player and wii was a favourite of our children on a rainy day with lots of games and dvds to choose from. Comfy bed with big space to have travel cot and a tv in the main room!I always forget the bath mat but there's one already there like home from home was very reassuring that our 1year old could toddle around the decking without the worry of escaping. Perfect quiet area with a little park very close by and very peaceful in the evenings. Will definitely be recommending to my friends and family and to anyone that wants a home from home modern place to stay we had the best time and will look forward to staying again. Gareth was amazing very fast response and excellent customer service from start to finish thanks for making our family holiday one to remember. They even had children's plastic cutlery with plates bowls and cups great for the kids! We booked the day before travelling, Booking and communication was great from Gareth very helpful and ready to answer any questions. The caravan is situated at the top of the site in a very beautiful cul-de-sac with lots of space around and no one passing your caravan in the night making a noise. So peaceful and incredibly relaxing. Being at the top of a hill it's an easy walk down to the entertainment and beach but a 15 walk back up from the beach pushing a pushchair and a slow 3 year old walking not bad at all. There is a small but lovely children's park right near the caravan so no need to go all the way back down. 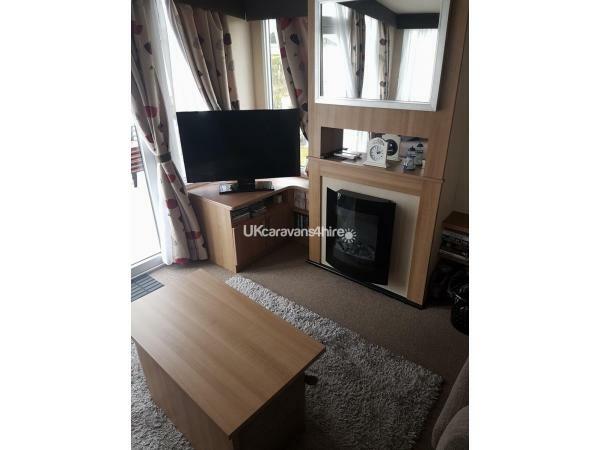 The caravan it self was fantastic well equipped and very homely with all the mod cons, the large TVs is great with the DVD player. The owner has left a great range of DVDs for guests to enjoy, board games and a Wii are also available for guests. In the family bathroom the large shower and shower head are great especially with little ones you can all get in. The owners have also left a large baskets of small toiletries i.e. Shampoos, conditioners, moisturisers which is great if you have forgotten something. There is even a new toothbrush kit amazing. Oh and there is a bath mat so no need to bring your own! The master bedroom with the en suite is nice and big enough for a travel cot at the foot of the bed, with its own TV. The other two bedrooms were great too the middle cabinet could be moved and the beds could be pushed together, or stacked on top of each other if needed to make room for a cot in one of the bedrooms. The caravan also has an amazing decked area that wraps around the front and side with a lockable gate the children loved it and safe too. The owners have thought of everything thank you for a lovely week in your holiday home we will be back and bring family and friends as the one next door is also available to rent. Fantastic! 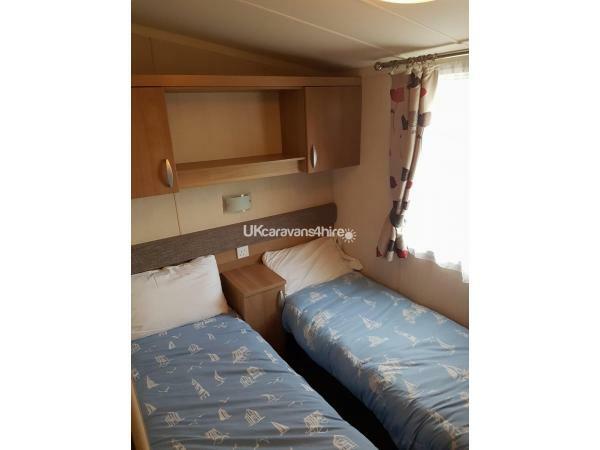 A really lovely caravan situated in a quiet part of the site. 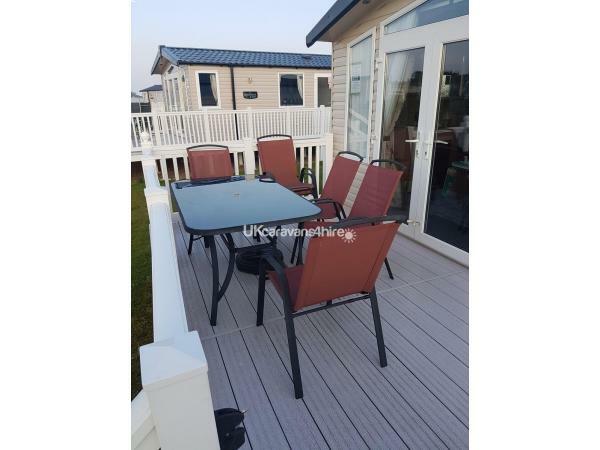 The caravan is to a high standard and the decking is ideal. Booking the caravan and communications with the owner was excellent. I would highly recommend and use again. Jason, glad you had a great time. Thanks for the nice comments. We would love to welcome you back. Our stay was fantastic we can't wait to come again. Gareth was very helpful from start to finish, very informative and was very quick to answer any questions. 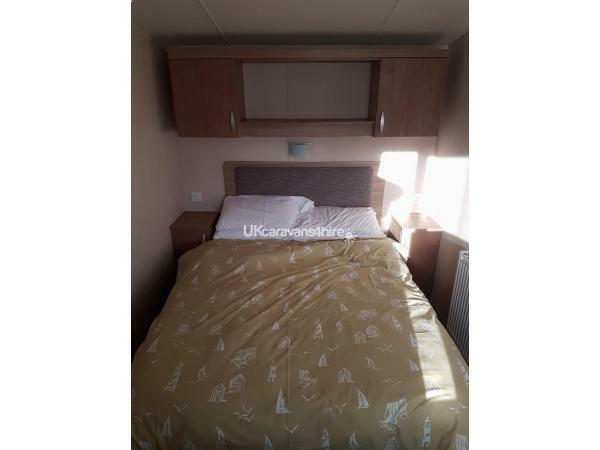 The caravan is very spacious and to an excellent standard, has everything you need. Perfect for children with lockable gate so they couldn't escape which was reassuring with young ones. Although the park had lots going on, we enjoyed a few drinks on the caravan decking and a good old game of scrabble (supplied in the caravan with other board games) one eve when the kids were tired from a hectic day. Thank you Gareth and family we had a great stay and will be back! Jade, glad you and your family had a great time. Your welcome back anytime. Fabulous caravan set in a lovely cul-de-sac which is great for kids. Caravan has all you need and the decking is a fantastic addition. The site is the best we've been on also for the kids. Will definitely come back. Really glad you enjoyed your stay. Glad the twins had a great time. Hope to see you again in the future.